Why is “Airplane!” called “Flying High!” in some countries? According to Wikipedia, the movie Airplane! is called Flying High! in Australia, New Zealand, South Africa, Japan, and the Philippines. I have looked online for some reasonable explanations as to why this is so, but nothing seems like a reasonable explanation. One explanation is that the word "airplane" is actually "aeroplane" in some of those countries. However, this doesn't explain why it isn't called "Flying High" in Britain. Another explanation is that before the movie was officially released, it was tested for audiences under the name "Flying High" in those countries. Apparently, it stuck. Does anyone know if either of those explanations is correct? Or is there another reason? Just thought I would add this interesting tidbit: I recently noticed that Netflix in Australia calls this movie Airplane! and not Flying High. I suspect the primary reason that Airplane! (1980) has so many aliases is because other countries did not have a series of popular disaster movies like Airport (1970), The Poseidon Adventure (1972), Earthquake (1974), Towering Inferno (1974), Heat Wave! 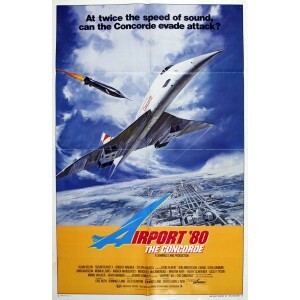 (1974), Airport 75, Jaws (1975), The Deep (1977), The Concorde... Airport 79, Plague (1979), etc. to provide the same context to the title we have. Even if the non-domestic audiences knew the Hollywood movies by the U.S. title, those audiences did not experience the onslaught of "me too" television disaster movies inspired by the 1970s movies. See IMDB's list of 1970s disaster movies here. Notice the great number of U.S. television movies made in response to the movies. It is rare to talk to a Brit who doesn't "correct" me when I say "airplane". No doubt that nuisance distraction is at least of part why some English speaking countries avoid the word completely. Flying High! is a much more apt title if one doesn't know the context of U.S. disaster movie titles, and is a nice double entendre with being high off the ground and stoned—or just being disastrously crazy. 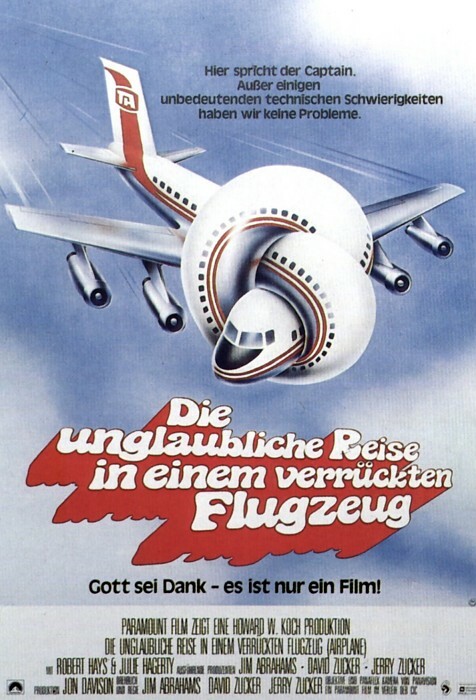 According to this (admittedly unattributed) post, Lesley Nielsen confirmed in an interview that the film was retitled "Flying High" in order to avoid any potential clash with the Australian film "Airport '80" (itself originally titled Airport '79: The Concorde) which had been re-released in the same cycle and would therefore have been showing at the same cinemas. As to why the entire Oceanian market had this change, I suspect that's more to do with the way that publicity materials are printed. Notably all the countries where it was changed (Phillipines, Indonesia, Japan) received posters in English, despite English not being the prevalent langauge whereas larger markets like Germany had fully customised posters and production materials in their own language. As all the mentioned disaster movies had been shown in Australia (I should know, I saw them all), I doubt that "lack of context" is the reason. I would suggest that in many of the countries, Australia & New Zealand in particular, the concept of "getting high" was less taboo than in the US & the title "Flying High" has a much more humorous double entendre connotation than the rather naff "Airplane". The only explanation I can think of is there was a tv series in the US on CBS in 1978-1979 titled "Flying High". Maybe the producers didn't want to confuse audiences with a similar title, but used this outside the US. Not the answer you're looking for? Browse other questions tagged title airplane . Why is American Pie called American Pie? Why is Rake Called Rake? Why do some movie titles include an alternate title? Why is the movie called Tangerine? Why is it called “Eastern Promises”? Why is it called “Match Point”? Why is the movie called “8 mile”? Why is it called Bull Durham?